The holiday season is here! And we at Performancing would like to share in the holiday spirit (whether Christmas, Hanukkah, or any other holiday celebrations we have this time of year) by releasing the ‘Tis the Season theme for WordPress. ‘Tis the Season uses the popular red-and-green color scheme that is very much in tune with the holiday seasons. The theme uses a fixed-width layout with a basic two-column structure featuring well-proportioned column widths. Again, here we use the rule of thirds popular among those well-versed in the arts, as with many other Performancing Themes for WordPress releases. The theme is widgets-ready, so you won’t have to worry about changing sidebar content when switching to and from the theme (like after the holidays, for instance). ‘Tis the season is light on the eyes and also light on the bandwidth, with minimal use of graphics (mostly the header image). The minimalistic look adds to the simplicity, and this lets your readers focus on reading your content. Still, if you want to insert ads or banners, the main column and the sidebar are wide enough to accommodate popular banner sizes. ‘Tis the Season is developed and supported by Performancing in cooperation with Brian Gardner. 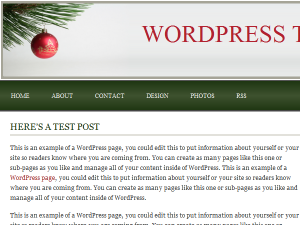 Update: ‘Tis the Season has been updated for compatibility with WordPress 2.7 and up. Download the latest version here. You can download ‘Tis The Season here. Get support in the Performancing Forums. What a great Theme. I appreciate the simplicity and the clean look. The two column format is great because it satisfies most of mt website layouts.